The longer you spend in Spain, the greater the number of “typical” Spanish items you’ll find yourself buying. We’ve rounded up 10 essential, quirky and stereotypical things anyone living in Spain needs. 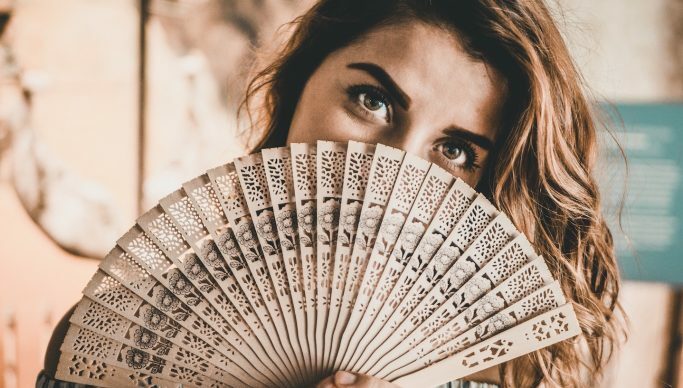 Regardless of technological advances, when you’re out and about a fan is the best way to keep cool (although men may have to make do with a piece of paper!). Don’t pay top prices for fancy collector’s fans as you’ll inevitably lose them or, more commonly, sit on one! Buy a couple at your local cheap shop and make sure you always carry one around as you never know when it’ll come in handy. From before the days of fridges and ice cubes, an earthenware jug, botijo, really does keep water cool. At 30 degrees and 40% humidity, in an hour a botijo can cool water by 10 degrees. It works due to evaporation through the porous clay so remember never to varnish or paint it as it won’t work as well. To avoid tasting the clay, fill it with water, leave it for a few hours to “sweat” (this will get rid of the dust inside) and change the water, it’s then ready for use. Originally designed for the San Fermin festival in Pamplona, Kukuxumusu now sell t-shirts and accessories across the world. With quirky designs, twists on Spanish sayings and humour they’re definitely a step up from the typical I Love Barcelona t-shirts. Take a look at their online store available in English, take a look at Amazon or buy in El Corte Ingles. Whichever team you support (or don’t), Spanish football is known the world over. However team shirts are ridiculously expensive and tend to change every season. Buy the previous year’s shirt once the new season model is available to save money. Watch out with online fake products, quality is poor and spelling mistakes are common. After the meltdown over Jamie Oliver’s recipe for paella with chorizo, at the end of the day when you make one at home you can decide what ingredients to include. When you use a good paella pan rather than a frying pan, the thick base helps to distribute heat so that the rice is evenly cooked. Regarding size, for 4 people a 30cm pan should be used, for 9 people 40 cm and for 14 people 50cm (bigger pans are available!). Did you know? 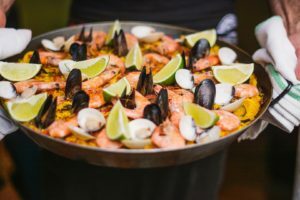 : Although the pan is commonly called a “paellera” across Spain, the correct word is actually “paella”. Where to buy? Believe it or not your local ironmonger is probably one of the best places! Where to start? You can find Spanish cookbooks for all kinds of recipes both online and at your local bookstore. Take a look at the Spain Buddy Recipes Book with 125 recipes or choose from your favourite section at Amazon. Take a look at Spanish consumer org. OCU’s list of top wines for under 3€, includes reds, whites and rosé. Spanish gin has made a comeback over the last few years in line with the worldwide fashion for G&T. For average-priced Spanish gins that are a bit different, take a look at Larios 12 Mediterranea or Rosé (made in Madrid, originally from Malaga) and Puerto de Indias Strawberry (from Seville). As for beers, we all know the big brands San Miguel, Cruzcampo and Mahou beers. But with the increase in craft beers on sale, your local supermarket beer aisle is full of lots of different ones to choose from. Here’s a great list of where to find craft beers in cities across Spain. And don’t forget blue wine! Definitely a talking point at dinner. What??? Yes, a mop. Invented by Manuel Jalón from Logroño, who not only invented the mop but also the disposable syringe. Although mop materials have changed since the 50’s, the mechanism is much the same. And with many homes in Spain having tiled floors, buying a good mop is a necessity. In English or in Spanish, get one version “for show” and another to actually read! You can read the full book in English for free online here (no need to download and totally legal!). There are versions for children to help understand what the story is about as well as animated films. The humble, flat shoes with a canvas or cotton upper and rope sole have come a long way since they were first documented in the 1300’s. But forget overpriced designer labels and buy some alpargatas at your local weekly market. Many have a rubber sole, but the rope area soon starts to wear or fray, so go for comfort and price rather than a designer logo.